Take a bite out of tedious studying and sink your teeth into the newest test-prep sensation. Join Bella, Jacob, and Edward as you learn more than 600 vocabulary words for the SAT, ACT, GED, and SSAT! 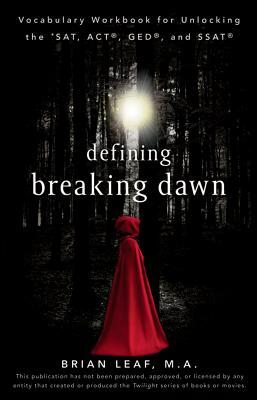 With hundreds of new vocabulary words, this book can be used completely on its own or as a follow-up to DefiningTwilight, Defining New Moon, and Defining Eclipse. You'll use this vocabulary workbook side-by-side with your own copy of Stephenie Meyer's Breaking Dawn. Each chapter of the workbook gives you eight words taken from Breaking Eclipse, with page references for you to read the words in the context of your favorite novel. Once you have a grip on the words and their meanings, you'll take SAT, ACT, GED, and SSAT drills to test and integrate your new vocabulary skills.